A formidable India will be aiming to make short work of minnows Hong Kong in their Asia Cup opener Tuesday before getting battle-ready for their much-anticipated clash against arch-rivals Pakistan on Wednesday. The match against Hong Kong will be an 'appetiser' before cricket junkies are treated to a lavish spread of main course which will be the Indo-Pak rivalry. Although Rohit and his colleagues won't want to take Hong Kong lightly, in reality the match will only be a pre-cursor or a glorified dress rehearsal before they take on an in-form Pakistan the very next day. In the searing Dubai heat, where the mercury has risen up to 43 degree Celsius, the primary aim for the Men in Blue would be to get their combination right before the big game. Hong Kong lost their opener against Pakistan by eight wickets in a thoroughly one sided showdown where they could manage only 116 runs. Unless a miracle happens, there won't be a remarkable improvement in their performance against an Indian team that boasts of the likes of Rohit, Shikhar Dhawan, KL Rahul, Kedar Jadhav in batting along with Jasprit Bumrah, Bhuvneshwar Kumar, Kuldeep Yadav and Yuzvendra Chahal in bowling. For the past few years, Mahendra Singh Dhoni's waning batting skills have repeatedly come under scanner and this tournament will give everyone a fair idea of his ideal position. Whether it would ned up being No.5, 6 or 7 will be the big contention going into the Pakistan game. If Dhoni comes in at No.7, he will have to face a skilful Mohammed Aamir at the death along with a skiddy Usman Khan and talented Hasan Ali. Possibly, Kedar Jadhav or Manish Pandey at No.5 and Hardik Pandya with his big hitting abilities at No.7 could prove to be ideal foil for the former India captain, if he decides to come at No 6. The middle-order that has been an issue for India for quite some time now and need to be sorted going into the World Cup next year. It is expected that KL Rahul will bat at No.3 but the incoming deliveries from Aamir or Hasan could be a problem like it has been in England. The BCCI has already hired a left-arm throwdown specialist from Sri Lanka to ensure that the Indian have no trouble tackling Pakistan's battery of left-armers. Also, they have Khaleel Ahmed in the team to give the batsmen much-needed practice. However, on flat decks with little movement from white kookaburra, the Indian batsmen can play their customary 'hitting on the rise' game with minimal footwork. The Hong Kong encounter will be a match simulater for the likes of Dhawan, Rahul and Pandya, who will have to adjust to the different length and pace of the track. 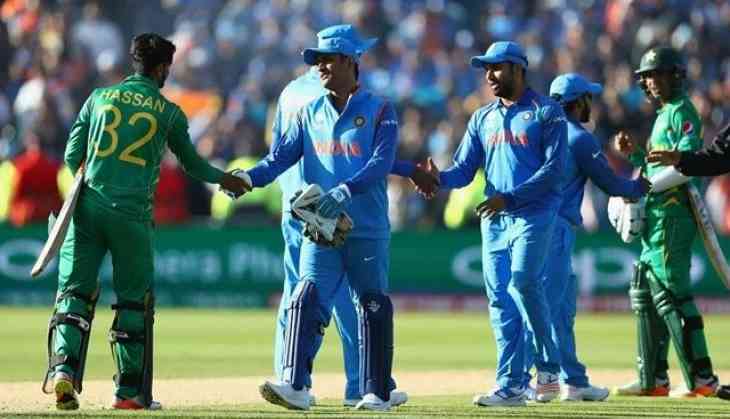 For Pakistan, the two Indian wrist-spinners will be unknown entities as they were not in the team that lost to Sarfraz Khan's men in the Champions Trophy final in England. Fakhar Zaman and Babar Azam are the two batting mainstays while Imam ul Haq (Inzamam ul Haq's nephew) has been pretty consistent so far. The oldest player in the line up, all-rounder Shoaib Malik, has tremendous experience of batting in the middle overs on low slow decks of the sub-continent. The Hong Kong game will also be ideal warm-up for Bhuvneshwar, who has been out due to back injury. The tickets for the Indo-Pak clash has been steeply priced with the hospitality seats costing USD 1600 (INR 1.15 lakh approx). The stadium is expected to be packed to capacity on Wednesday but one can expect a sizeable Indian population on Tuesday itself during the Hong Kong game. India: Rohit Sharma (captain), Shikhar Dhawan, KL Rahul, Ambati Rayudu, Manish Pandey, Kedar Jadhav, MS Dhoni (wk), Hardik Pandya, Bhuvneshwar Kumar, Jasprit Bumrah, Kuldeep Yadav, Yuzvendra Chahal, Shardul Thakur, Dinesh Karthik, Khaleel Ahmed. Hong Kong: Anshuman Rath (captain), Aizaz Khan, Babar Hayat, Cameron McAulson, Christopher Carter, Ehsan Khan, Ehsan Nawaz, Arshad Mohammed, Kinchit Shah, Nadeem Ahmed, Raag Kapur, Scott McKehnie, Tanvir Ahmed, Tanvir Afzal, Waqas Khan, Aftab Hussain. Match starts 5 pm (IST).